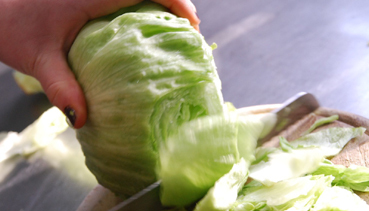 Wash the lettuce leaves & dry thoroughly. Spread each of the lettuce leaves with a generous dollop of hummus. (You could also use mushed up avocado if you preferred.) See the next recipe for how to make your own homemade hummus. Arrange the chicken/turkey, cucumber, carrot & avocado in the lettuce leaves. Roll up the lettuce leaves as you would a wrap. You can secure it with a toothpick if you need to. Tip: If you are taking these to work or on a picnic prep all the ingredients, but put the lettuce leaves in a separate bag to the rest of the ingredients & assemble them when you are ready to eat. This will stop the lettuce from going soggy.